The state of New York has 271 institutions of higher education, with a majority part of the state system, city system or independent. The State University of New York (SUNY) operates 34 campuses statewide, serving nearly 222,000 students in fall 2010. The sheer size of New York college enrollment has made blended and online learning a major benefit for both the schools and the students. For schools, it’s an affordable way to scale enrollment, and for students, it’s a flexible way to earn a degree. Learn more about online colleges and universities in New York, and how these schools and students are taking advantage of fast-growing learning model. With one of the largest student bodies in the U.S., New York has a higher education landscape prime for online learning growth. In 2012, just 9 percent of college students in the state took an online class. However, more and more New York online schools are adding blended and online programs and classes to their curricula, giving students the chance to earn credits in a more flexible setting. But which of these schools have the top programs? Which have affordable tuition, regional accreditation, faculty trained in online delivery and tech platforms that facilitate collaboration between cohorts? 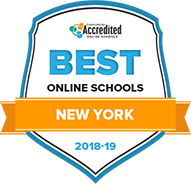 We profile the online colleges in New York stand out in 2018 below. Located in the middle of the state, Utica College is a smaller, more focused school that offers many of the benefits of a larger institution. Aside from their already prestigious on-campus courses, Utica has since expanded into the online sphere, bringing the same quality and respect that they've earned over their past 70 years to their online programs. Currently, Utica College offers 6 online programs, most of which are entirely online and are structured to be completed in the traditional 4-year period. The only exceptions to this are the bachelor's in fraud and financial crime, the RN-BSN program and the accelerated bachelor's in nursing program. Through the 2 nursing programs, students will either be required to be a registered nurse, or they will be required to partake in a hybrid program of online and on-campus courses. No matter which program students apply to, they will also be required to complete clinical hours to gain nursing certification in New York. Students should note that some of the online programs offered by the school are technically degree completion programs, such as the bachelor's in fraud and financial crime, and will require students to already have a minimum of 57 credits. Credits can be earned either through Utica's on-campus courses, through an associate degree or via transfer credits. Also, students in other programs can reduce the number of courses necessary to graduate if their credits apply. In terms of affordability, Utica College charges a flat rate per credit, making it easier for students to budget for their education. Niagara University is a private institution that draws from the teachings of St. Vincent de Paul, an advocate of charity, teaching and service. With this in mind, Niagara has established itself as a top location for students who want to earn a degree in education, as well as a destination for students who want to partake in a service learning mission-based program. Niagara might not have the most extensive list of online opportunities, but they are all high-quality. There are currently 6 programs offered by Niagara that are entirely online, along with online courses and certificates that students can use to specialize their education. While the programs offered are entirely online, some students should expect to spend time working in-person. As an example, students studying toward a bachelor's degree in special education online will have to spend time in the field gaining clinical experience in order to become teaching certified (if that's what they are pursuing). Other programs, like their bachelor's in educational leadership, won't require students to study in-person or on-campus unless they choose to. Online education through Niagara doesn't leave students to their own devices. Working through Canvas, students will spend time learning on their own while having video conferences with other students and the professor. Online students can expect to be engaged in other ways as well, all via the internet. Aside from any scheduled meetings or video calls, students will be able to study materials at their own pace. This unique model is part of the reason why so many online Niagara students are successful after graduating. Canisius College is set apart from other schools because of their Jesuit tradition and their emphasis on master's level programs. That being said, the college does offer over 140 different undergraduate programs to complement their 35 graduate level degrees. Canisius offers 11 different online master's degree programs. These programs can all be completed entirely online, and some through a hybrid format if students want to combine their studies online with on-campus courses. The length of these programs can vary, and some programs may also require some in-person work to earn certification, if that's what a student is aiming for. Their Teachers of English to Speakers of Other Languages (TESOL) program stretches from first-year undergraduate to an 18 credit master's certification. While some of the coursework and professional experience needs to be completed in person, parts of this comprehensive program ? such as the master's degree and the advanced certification ? can be completed online. While their TESOL program is one of their most comprehensive to be offered online, other online master's degrees are available, ranging from Catholic studies to biology. Part of the larger State University of New York system, SUNY College at Oswego is one of the best at offering affordable online options. Offered through Blackboard, their online school takes some of the resources offered by the SUNY system and adds some that are specific to the College at Oswego. The College at Oswego also offers internship opportunities for students in some programs, setting it apart from many other online schools. The online undergraduate programs offered by the College at Oswego are degree completion, meaning students should have some form of previous school credit before applying. School credit is accepted through either associate degrees or transfer credits. Also, different online degree completion programs will require different credits prior to entry. For example, the online bachelor's in broadcasting and mass communication requires at least 60 credits prior to entry while the online bachelor's in career and & technical education requires only 30 credits. Credits earned on-campus can be used toward the degree completion programs as well. For students who don't want to apply to one of the College at Oswego's 4 degree completion programs, there are over 100 online courses that can be used to supplement a hybrid degree during traditional semesters. Students who want to earn their degree faster can access 50 online courses during the winter and 180 online courses during the summer. There are also a variety of online master's degrees and certificates for students who want to continue or specialize their education. Located not far outside of New York City, Stony Brook University is a younger school in the state, but they've made in impression in their 60 years. Known for their combination of quality education and affordability, Stony Brook has been pushing to continue improving its already impressive reputation. Their most recent push has been into distance education through their online program. Stony Brook's online school may not be as large as other institutions, but they do an excellent job of making their online programs just as rigorous and challenging as their on-campus versions, helping students get a better education and preparing them for their future professions. Of the undergraduate programs, one of the most popular is their online electrical engineering program. One of the only online electrical engineering programs in the nation, this entirely online 4-year program is designed for students who are also working full-time. The electrical engineering program is taught by faculty members from 3 different universities as well, giving students access to more resources than similar programs might offer. Unlike many other online engineering programs, this program is offered entirely online. Stony Brook also offers an online biology undergraduate degree that can be specialized with one of two majors and 8 different online master's degrees. On top of that, Stony Brook has certificates that students can earn online to specialize their degree. Courses are offered year-round, and online students have access to advisory groups and other online resources. The Sage Colleges are a united collection of multiple colleges scattered across New York. Their main campus, located in Troy, was founded in 1916, and is recognized for its undergraduate and graduate level liberal arts programs. One of their newest campuses is online ? the Russell Sage Online school. Like most online schools, Russell Sage Online offers flexibility in scheduling. But what sets Sage apart is their option to accelerate all of their online programs. Of the 2 fully online bachelor's degrees offered, the most interesting is the bachelor's of science in information technology with a focus on cybersecurity. This 4-year program prepares students for a role in cybersecurity. To help prepare students to their job search upon graduation, the program prepares all graduates to take and pass 12 different IT certifications. Their other bachelor's degree program in business administration also takes 4-years and can be specialized with a certificate in IT. Transfer students with over 90 credit hours can likely reduce the time it takes to earn either of these degrees. The Russell Sage Online program has gained renown in New York for its affordability. Instead of charging students based on the program they study or the state they currently reside in, this program charges a flat rate per credit. Prior to beginning online classes, students will get a one-on-one meeting with a tuition counselor to completely understand the cost of an online education. Also, Sage has opted to waive the application fee for all online applicants, keeping costs low. Among the top public schools in New York, SUNY College at Brockport has built a school culture of engagement, both in and out of the classroom. College at Brockport students have access to opportunities outside of school, giving them a more rounded education and helping them stand out against the competition when applying for jobs. Also helpful is the College at Brockport's extensive alumni network that reaches around the world, although many grads remain in New York. The College at Brockport currently has one main undergraduate program offered fully online: their RN-BSN fast track program. In this program, students will take courses online whenever they choose ? but they will be required to spend time in-person for clinical experience, as is required for certification. For students who prefer a hybrid option, the RN-BSN fast track program has that available as well. The length of the program depends on how many credits students come in with. The College at Brockport currently only allows up to 64 transferrable credits for the program. Along with their undergraduate program, there are also a variety of graduate degrees available entirely online, particularly through their school of education & human development. Aside from online degree programs, the College at Brockport offers a variety of online courses, so students can easily earn a degree through a combination of online and on-campus courses. Online courses are taken through the Blackboard Learning Management System, and students can access their coursework as long as they have a computer and internet access. St. Joseph's College is a New York based institution that has three main campuses: Brooklyn, Long Island and online. They offer a slew of undergraduate options, including dual degree and accelerated degree programs, as well as opportunities to gain professional experience while in school. Currently, St. Joseph's College offers over 20 online programs, 6 of which are at the undergraduate level. The bachelor's degrees offered are available entirely online, but students are allowed to study in a hybrid of online and on-campus for some courses. There are no online minors available, but St. Joes has 4 certificates designed specifically for undergraduate students. These are useful for supplementing a student's education while giving them extra skills and experience when they look for a job in their new field. To keep the cost of education lower for online students, St. Joseph's charges a flat rate per credit. Because this is lower than the cost of attending the school in a traditional way, they don't provide any additional financial support ? however, many students earn state and federal grants to further reduce their tuition costs. Many of the students that apply to St. Joseph's online are new to college, but some will come in with credit from other schools. If students have already earned 24 transferable college credits, they won't have to supply as much information during the application process. Also, this will speed up the timeline for graduation, reducing the total cost of the program. With 5 campuses scattered across the globe, Rochester Institute of Technology is no stranger to non-traditional education. Based primarily out of Rochester, New York, RIT has grown into a 9 college university with over 15,000 students. But not all students are able to study in the traditional, on-campus format. To help, RIT created their online school, building off their decades of experience with distance education. While RIT does offer different undergraduate and graduate level programs that can be completed entirely online, they set themselves apart through the additional benefits offered through their online school. Job placement is an emphasis for RIT, and they pride themselves on helping place online students with jobs around the world. To make sure that students do end up in the role they want, RIT also gives online students access to advisors to help steer their education toward their career goals. Students with previous credits from another institution can transfer their credits toward their degree, and some credits can be awarded through work experience. Students who do choose to study online also receive a financial benefit. RIT discounts their traditional part-time undergraduate tuition rate by 36% for all new online students, keeping education affordable. Combined with other forms of financial aid, studying online can be much more affordable than earning an education the traditional way. Also, RIT's online school doesn't' follow the traditional semester or quarter systems. Courses start at 5 different points each year, allowing students to jump in whenever they're ready. Whether students are looking to finish their education or are just starting out, the online school at Marist College offers several opportunities. Like many online schools, Marist has structured their 10 bachelor's degree programs to fit the busy schedules of non-traditional students, allowing them to study at their own pace but still complete a degree in 4 years. However, Marist College separates itself by offering a unique accelerated online course option. The online accelerated courses are for undergraduate students only, and they satisfy the core courses needed to graduate. Accelerated courses last 8 weeks in the spring, summer and fall and last only 4 weeks in the winter. The current bachelor's degree programs are actually meant to be degree completion programs, meaning Marist expects that many of their online students will come in with previous school credit. Students are not required to have previous credit upon applying, though. All of the degrees currently offered are available entirely online, but students are allowed to study in a hybrid format of online and on-campus, giving students flexibility to study in whatever way works best for them. Because Marist's online degrees are also designed for degree completion, transfer students are more than welcome to apply, and their previously earned credit can go toward completing their online degree. All tuition and fees are the same for students regardless of which state they live in and whether they are studying in an entirely online or hybrid format. Roberts Wesleyan College offers degree completion programs in nursing, business and health administration, either 100% online or in a 1-night a week on-campus format. Programs are 15 months in length, and require 36-37 credits, with 124 credits total for completion. Some on-campus time may be required, as with the RN-BS nursing program, which requires students to attend classes for the library practicum, writing lab, orientation and practicum project. The health administration program has a research project requirement, which allows students to work with local health care executives. Business students can add an area of concentration in corporate security management. The admission criteria is similar for all these programs, and includes a minimum of 60 transferable credits, which may include credits for life or professional experience, with a 2.0 cumulative GPA required. Students must also submit college transcripts, write an essay and provide a resume of current professional experience, as these programs require relevant work experience. Nursing students must also have completed an associate degree or diploma program in nursing to be eligible and currently be working as a licensed RN for at least 20 hours a week. The business and health administration students must also have completed freshman composition with at least a "C" grade to be accepted. Courses are typically delivered in an asynchronous format, with required online meetings, presentations, group activities and cohort discussions. In addition to faculty and cohort support, students can also work with the Career Development Office for guidance and assistance in areas such as academic preparation, career development, networking opportunities and job search skills. The University at Buffalo has several undergraduate degrees that combine on-campus classes with online elements, such as the Bachelor of Arts in Communication and the Bachelor of Science in Computational Physics. Combination degrees in education that allow students to earn both a bachelor's and master's degree simultaneously are also available online, with possible on-campus visits required. These are considered accelerated degrees and can lead to New York teacher certification for grades 5-12. Teacher specialization areas include biology, chemistry, Latin, geology, history and mathematics. Another online degree option is the BS-RN track, a bachelor's degree available 100% online for RN's who have already completed an associate or diploma nursing program. This is a 32-credit program that can be completed in 12-24 months, and start time is once a year in May. Admission is highly competitive, and students must apply to both UB and the School of Nursing. Transcripts and completion of the statistics prerequisite course with at least a 3.0 GPA are required, with recommendations, test scores, class ranking, a personal essay and a resume also considered for admission. Rather than mandatory clinical rotations, students are required to work as part-time RNs throughout the program. Service learning opportunities are built into the curriculum, and take place through local community agencies, and students can also join the Nursing Student Organization and Multicultural Nursing Student Organization for further involvement. Resources for nursing students include advisement through the School of Nursing Office, access to an extensive health care database, research opportunities through the Center for Nursing Research and internal scholarships specific to nursing students. Through its University College division, Syracuse University, a major, private research institution, offers 4 bachelor's degrees that can be earned 100% online. The Bachelor of Professional Studies in Creative Leadership prepares students for management careers in areas such as marketing, administrative services and training and development. The Bachelor of Professional Studies in Cybersecurity Administration provides students with the skills to supervise and manage technologies needed to protect infrastructures and information systems. Bachelor of Professional Studies in Knowledge Management students learn the skills and practices required to manage the data and technology prevalent throughout all sectors of today's economy. SU's Bachelor of Arts in Liberal Studies degree offers students a solid general education foundation in the natural and social sciences, humanities and mathematics attractive to a broad range of employers. All 4 degree programs require completion of 120 credits of general education, major-related and elective coursework with a C grade or better. Up to 90 credits of previously earned college work can be applied toward program requirements, significantly cutting degree completion times. Courses are offered in a synchronous, interactive live session format. While all coursework for these degrees can be completed fully online, students have the option of participating in on-campus courses when available. Online University College students are eligible for the same range of student services and resources available to their on-campus counterparts, including academic advising, financial aid assistance and the online services and resources of the Syracuse University Libraries system. Application Deadline: No deadlines, rolling admissions. GPA: No specific minimum requirement. Standardized Test: SAT or ACT required. No stated minimum scores. Touro University Worldwide, the distance learning arm of the Touro College & University System, offers 4 bachelor's degrees that can be earned 100% online. TUW's Bachelor of Business Administration is available with 7 concentrations, including Criminal Justice, Entrepreneurship, Marketing and Homeland Security EDM. The Bachelor of Arts in Psychology degree, offered with 6 concentration options, prepares graduates for careers in the psychology field, like psychiatric technician and counselor, as well as positions in business, social work, education and technology. The Bachelor of Arts in Social Work leads to careers as social workers primarily with state and local government agencies. TUW's Bachelor of Science in Health Sciences prepares students to pursue careers throughout the health care field as community health organizers, facility managers, lab managers, health educators and more. All TUW online bachelor's degrees require completion of 120 credit hours of coursework consisting of general education, major/core and elective courses. Courses are presented in an 8-week format. Students who opt for full-time study (12 courses per semester, 3 semesters per academic year) can finish their degree program in 3? years. Actual completion times vary, however, based on total number of applicable transfer credits and the individual student's chosen course load. Up to 90 qualifying transfer credits can be applied to a degree program. Admission requirements include a high school diploma or GED, or transfer in from another properly accredited college or university. Student services and resources are accessed through TUW's Student Success Center. Services include student orientation, academic and life goal counseling, disability services, networking and job search assistance through Career Resources and access to eBooks, eJournals, educational videos and other digital materials via the Touro College Libraries system. Application Deadline: Rolling admissions; Deadline for specific term usually the Friday be for the term start date. GPA: Transfer students: 2.0 for college work; Others: no requirement. Fordham University is a major private research institution and the oldest Catholic-affiliated university in the northeastern U.S. Through its School of Professional and Continuing Studies (SPCS), Fordham offers an extensive number of bachelor's degrees that can be earned through a combination of evening, weekend and online classes. There are currently 18 major subjects to choose from, including Business, Communications and Media Studies, International Studies, Philosophy, Political Science and Theology/Religious Studies. These degree programs, as with all others offered by the SPCS, are designed to meet the unique needs of adult learners with evening classes that meet once a week for 3 hours a session, and weekend classes that meet either for 5 hours every other Saturday or Sunday throughout the term or 8.5 hours per session over two weekends each semester. No Fordham bachelor's degrees are available fully online. All of Fordham bachelor's degree programs are degree completion programs, meaning that students enter with some amount of previously earned college credits. Up to 75 credits may be transferred in for prior coursework. Additionally, up to 30 credits may be awarded for the student's life experiences (by way of portfolio submission). A total of 124 credits (including transfer credits) must be completed to earn the degree. Admission requirements are also geared toward the adult learner and based on an overall evaluation of the applicant's qualities and life experiences. Standardized test scores need not be submitted. Support services available to Fordham undergraduate students include career advisement through the Fordham Futures and Career Development Resources programs, and both in-person and remote access to the extensive resources of the Fordham University Libraries system. Application Deadline: Fall: June 1; Spring: November 1; no summer admissions. Adelphi University, a private institution, offers a single bachelor's degree that can be earned with online study. AU's Bachelor of Science in Emergency Services Administration is designed to broaden the knowledge and skills in emergency services management of individuals currently working in the profession, as well as to provide a head start for those interested in entering the emergency services field immediately after completing their degree. The program additionally shortens the path to obtaining the Certified Emergency Manager (CEM) certification from the International Association of Emergency Managers (IAEM). Graduates of the program find employment in a range of industry sectors, including governmental emergency agencies, public health agencies and organizations, hospitals and emergency health care services providers and with the Department of Homeland Security. Earning the AU BS in Emergency Services Administration requires a total of 120 credits of coursework, 50 of which are in the major subject. The program is designed to be completed in 4 years. However, students can transfer in up to 90 credits of previously-obtained college coursework and up to 60 prior learning credits for qualifying public service training to significantly reduce program completion time. This degree program is offered 100% online, meaning that students are not required to come to campus at any time. Courses are presented in an asynchronous format so that lectures can be viewed and assignments worked on at the student's convenience. However, assignments must be completed according to course schedule deadlines. AU's extensive support resources for online students include tutoring services through the Learning Center, technical support from the Office of Information Technology's Help Desk and research and academic resources via the AU Libraries online portal. Standardized Test: SAT or ACT required. No minimum scores indicated. New York University, a private, nonsectarian research institution, offers 2 online bachelor's degree completion programs through its School of Professional Studies Division. The Bachelor of Arts in Social Sciences with a concentration in Organizational Behavior and Change is designed to provide students with a solid foundational liberal arts education leading to career advancement or continued graduate-level studies. Students in this program develop a keen understanding of organizational theory and its applications, and learn to diagnose organizational systems and apply their skills to meet strategic challenges within organizations. Participants in this program who have completed at least 30 credits at NYU's Division of Applied Undergraduate Studies or another properly-accredited college or university, and who have completed a college algebra course with C or better grade, are eligible to earn their degrees entirely through online study. Students with 2 college-level mathematics courses earned with a C or better grade may complete NYU's Bachelor of Science in Leadership and Management Studies degree in 1 of 3 concentrations 100% online. The 3 concentrations available for online study are Organizational Management and Development, Human Resource Management and International Business. Graduates with this degree are prepared to enter or advance careers as analysts and managers in private business fields such as insurance, finance, marketing and media, as well as nonprofit fields such as education, health care and the arts. Many graduates continue their educations to earn an advanced degree. Both online degree programs require 128 to 130 credit hours of coursework. Degree completion times vary depending on several factors including chosen course load and the number of previously-earned college credits transferred into the program. Online students have access to the same support programs as all other NYU students, including comprehensive career and academic advisement, tutoring services, study abroad opportunities, internships, and the resources of the Jack Brause Library and Information Center. GPA: GPA considered. No predetermined minimum, but NYU "interested" in applicants with GPA of 2.7 to 3.2. Pace University is home to 5 bachelor's degree completion programs that offer fully online coursework. Through its iPace program, students can choose from among 4 online bachelor's degrees: Bachelor of Business Administration in Business Studies (with Marketing & Management and Accounting & Internal Auditing concentration options), Bachelor of Science in Professional Communications Studies, Bachelor of Science in Professional Technology Studies (with Business Technology Leadership and Computer Forensics concentration options) and RN to Bachelor of Science in Nursing. Admission into an iPace online bachelor degree completion program requires at least 56 qualifying transfer credits. Students with less than 56 transfer credits may opt for the Associate in Arts in General Arts and Science (A.A.) degree program, also available 100% online, to gain the required bachelor program credits. All courses are presented in an asynchronous format allowing for students to complete their coursework according to their own schedules. In addition to the iPace degrees, Pace University offers a fully-online Bachelor of Science in Professional Technology Studies degree through its Seidenberg School of Computer Science and Information Systems in conjunction with the National Coalition for Telecommunications Education and Learning (NACTEL). The degree is available with 2 concentrations: Telecommunications and Business Technology Leadership. The BA in Professional Technology Studies is designed primarily for individuals currently working in the telecommunications business sector who are interested in gaining industry credentials and advancing their careers. Both concentrations require 120 credit hours of coursework consisting of 60-64 transfer credits and 56-60 credits earned through Pace. Pace online students have access to a wide range of support services including tutoring, writing assistance, career advisement and the distance education resources of the Pace University Library. Application Deadline: iPace degrees - Fall: August 15; Spring: December 15; Summer: April 15. NACTEL degrees: Continuous. GPA: 2.5 on previous college work, except for BBA in Business Studies, which is 2.75. Standardized Test: Degree completion programs: no. Nyack College, a private educational institution affiliated with the Christian and Missionary Alliance, currently offers 3 bachelor's degrees that can be earned entirely through online study. Nyack's Bachelor of Arts in Psychology provides all of the academic components of a traditional psychology degree curriculum and includes concentration options in the science of psychology and practical application of psychology. Graduates of this program pursue careers in a wide range of occupations, including behavior analyst, rehabilitation specialist, foster care counselor, juvenile detention specialist and pastoral counselor. Students enrolled in Nyack's Bachelor of Science and Bachelor of Professional Studies in Organizational Management degree completion programs gain the knowledge and skills to become leaders and agents of change within their organizations. Graduates with these degrees find careers in administrative and supervisory positions in all economic sectors, including government, human resources, nonprofit organizations and private industry. Distance education at Nyack College employs "community learning", in which clusters of 10 to 25 students begin their studies and complete their degree programs together. The purpose of community learning is to promote an interactive and supportive learning environment that helps students stay on course throughout their programs and create lifelong relationships between students. All degree courses are informed by a Christian worldview. Degree completion times vary by specific program, course load and the number of previously earned college credits applied. Students may also be awarded credit for career and life experience. Student support resources at Nyack College include tutoring, writing assistance and career counseling services. Additionally, online students have access to the extensive resources of the Nyack ATS/Bailey/Eastman Libraries system. Nyack College is regionally accredited by the Middle State Commission on Higher Education. GPA: Required, no minimum score. Standardized Test: Required, no minimum score. Private, nonsectarian Mercy College offers over 2 dozen bachelor's degrees featuring coursework that can be completed 100% online. Degrees are available in fields such as business, computer science, English, mathematics, nursing, psychology, sociology and Spanish. Of particular note are 8 Behavioral Science options and a Business Administration degree with concentrations in General Business, International Business and Sport Management. Also available are 4 B.S./M.S. programs that allow students interested in teaching careers to earn both their bachelor's and master's degrees in a single program through a combination of online coursework and classroom-based clinical experiences. All regular bachelor degree programs require 120 credit hours of coursework (with the exception of the RN to Bachelor of Science in Nursing Completion Program, which requires 123 credit hours) and are typically completed with 4 years of full-time study. Actual completion times vary, however, depending primarily on the individual student's chosen course load and the number of previously-earned credits transferred into the program. Students can transfer in up to 75 credits from 2-year schools and up to 90 credits from 4-year schools (no more than 90 total from a combination of schools). Support resources available to distance learners include an online learning center, academic advising, financial assistance, career services and database, eBook, eJournal and other resources from the Mercy College Libraries system. In addition, as part of Mercy College's PACT (Personalized Achievement Contract) Program, all undergrads are assigned a personal advisor who helps guide them in deciding on the right major, understanding degree requirements, tracking academic progress, exploring career opportunities and more. Tuition: RN-to-BSN: $425.00 per credit; All other bachelor's degrees: $774.00 per credit (less than 12 credits for term), $9,200.00 per term (12 credits or more). Application Deadline: No deadlines, rolling admisssions. Mercy recommends having all application forms and documents in 30 prior to term start date. GPA: Freshmen: no specific GPA minimum. Mercy takes holistic approach to admissions. Transfer students (12 college credits or more): 2.0 on college work. Standardized Test: Freshmen: SAT/ACT scores optional. Mercy takes holistic approach to admissions. Transfer students: no standardized test requirement. How can I find which online colleges offer the degree I'm looking for in New York? The first place to look may be OpenSUNY, which has information on every online degree offered from the State University of New York's accredited institutions, such as SUNY Empire State College. You might also use the National Center for Education Statistics' College Navigator and the Commission on Independent Colleges and Universities' New York website, which provides information on private institutions in the state. Which online schools in New York will accept my transfer credits or work/life experience? Most online programs in New York accept course credits earned at other accredited schools. To get credit for a course already taken, acquire your transcript. To obtain credit for skills and knowledge learned from work, take a College-Level Examination Program computer-based test, which costs $65. The test center may also require a separate, non-refundable administration fee, usually $15. Institutions vary on the number of credits they accept, so check with a transfer adviser at the schools in which you're interested to maximize the time and money you've already invested in your education. An online search might also reveal policies on transfer credits at different New York colleges and universities. How Much More Do College Grads in New York Make? Everyone has heard that a college degree can boost earnings power, and that holds true for professionals in New York. Let’s see how salaries look for occupations based on their minimum degree requirement. The data shows a clear monetary benefit when it comes to higher education. A bachelor’s degree means a fairly substantial increase in salary for those who hold the credential. However, it’s important to note that CEOs and other executives may only have a bachelor’s degree, but they’ve built their salaries on years of management and leadership experience. Still, the four-year degree was a great starting point, allowing them to build their careers with a stable foundation. Whether studying online, on campus or with a combination of both, accreditation is the key to ensuring you’re getting a quality, affordable education. Proper accreditation shows prospective students that a school and its programs have been vetted by an organization recognized by the U.S. Department of Education. But what does proper accreditation mean? It’s not as straightforward as you might think—learn more about how accreditation really works. Regional accreditation is the only school-wide stamp of approval that matters. The Department of Education recognizes six regional accrediting bodies, each of which cover their own group of states. The Middle States Commission on Higher Education covers all colleges and universities in New York. If you’re looking at schools in New York state, make sure each candidate has Middle States accreditation. If your interests lie in highly specialized areas like design or art, there are schools in New York with specialized and subject-specific accreditations. For example, The New School's Parsons School of Art and Design is accredited by the aforementioned Middle States Commission on Higher Education and the National Association of Schools of Art and Design. Further, its architectural program has the National Architectural Accrediting Board's stamp of approval and is a member of the Association of Independent Colleges of Art and Design. Tuition rates have continued to rise in New York, which can be difficult considering the power of a degree in earning a higher salary. While online programs may have similar costs to campus-based programs, students can save money on things like room, board, parking and more. In some cases, this can make online colleges in New York a more affordable learning option. Here’s a quick look at in-state tuition in New York, followed by some important FAQs on paying for online college. What are New York's requirements to qualify for in-state university tuition? Pursuing an online degree can provide significant savings if you live in or out of the state. Many institutions in New York provide one flat rate for online students, whether you are an in-state resident or not. For example, the City University of New York (CUNY) School of Professional Studies charges all online students in-state tuition of $295 per credit hour, compared with an on-campus non-resident’s rate of $600 per credit hour. Are online credits more affordable in New York than other places? Prices for online credits differ more from school to school than state to state in New York. For example, New York University students enrolled at the College of Arts and Science pay $24,628 in annual tuition for 12 credits, while CUNY School of Professional Studies students pay $3,540. The best thing to do is decide which programs you are interested in and compare them to find the most affordable one for your budget. How can I get help paying for online college in New York? Financial aid is a great way to pay for online college in New York. Scholarships and grants also help students tackle tuition and work toward their degrees. Take a look at a few of the top scholarship opportunities in the state. The most notable award is the Excelsior Scholarship Program, which in combination with other student financial aid programs, allows New Yorkers to attend a SUNY or CUNY college tuition-free. It is the nation's first attempt at providing students with free college. To be eligible for up to $5,500 per year, you must have a combined federal income of $110,000 or less, enroll in at least 12 credit hours per semester, complete at least 30 credits successively each year towards a degree, and promise to live in New York for the length of time the award is received. Other programs include the NYS Aid to Native Americans Award for members of a NYS tribe or their children who reside in New York for up to $2,000 per year for full-time students. Aid for part-time study is also available for $2,000 per year or tuition costs at participating New York State colleges. In addition, $231 million is granted through the Tuition Assistance Program at New York's private colleges and universities. A list of awards can be found at Commission on Independent Colleges and Universities. Additionally, New York schools offer their own scholarships, which can be found at the schools' financial aid offices. Check with each institution for need- and merit-based aid forms. Finally, U.S. citizens can also apply for Free Application for Federal Student Aid (FAFSA) by at least March 15 of the year before you plan to attend college. Most applications for aid have strict deadlines and require proof of residency or citizenship as well as transcripts. Some will also require an essay and others a recommendation. Enrolling in adult education programs can be the first step towards a college degree for many New York students. These programs are designed to prepare students for the academic and technical rigors of college life, whether attending an online program or taking classes on-campus. Often, these students have jobs and veer towards more flexible means of learning such as night, weekend, and online programs, providing a perfect segue into earning an online college degree. Literacy and language assistance Learning or brushing up on basic literacy and comprehension skills can be essential for adults who haven’t been in the classroom for a long time, or those who are non-native English speakers learning a new language. High school equivalency testing In New York, the Test Assessing Secondary Completion (TASC) is replacing more commonly known GED programs for earning a high school diploma. Operation Recognition is a Veteran-specific program offered to help credit those who served in WWII, Korea and the Vietnam war. Study materials for Basic Education classes The state offers a library of instructional materials for basic adult education in the form of videos. According to the U.S. Department of Education's National Reporting System for Adult Education, women in the state take the most advantage of adult education opportunities, making up nearly 67,000 of the roughly 106,500 served between July 1, 2016 and June 30, 2017. Almost 65 percent had acquired measurable skill gains, too.